Irrigation pumps can be powered using various energy sources, including electricity, diesel, natural gas, liquefied petroleum gas (LPG), gasoline, and ethanol. Diesel and electricity are the primary sources of energy for irrigation, with minimal use of gasoline and ethanol. Each energy source has a different energy content per unit as shown in Table 5. In addition, the ability of a motor or engine to convert energy content to productive work to pump water depends on the energy source. In terms of energy, electricity is the most efficient power source ranging between low 80% for small horsepower motors to over 90% for large horsepower motors; internal combustion diesel engine efficiencies range between 25% and 37% and gasoline engines between 20% and 26% (Evans et al., 1996). However, certain factors may prevent or limit the use of different energy sources in particular areas. For example, electric lines as well as three-phase service may be limited in rural areas and in areas near water sources. County, NE, and can be found at: http://lancaster.unl.edu/ag/crops/irrigate.shtml. Historical energy prices can be used to infer which energy source may be the most economic over time when designing and/or upgrading the power unit of a pumping plant. 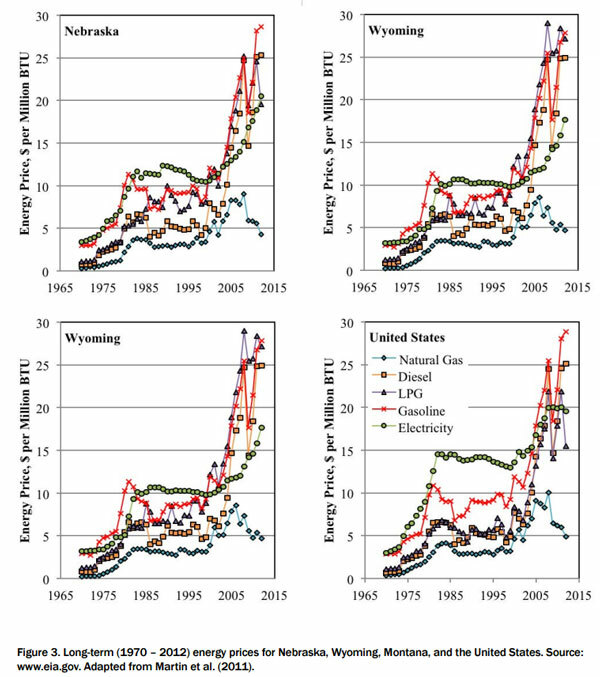 Figure 3 shows average long-term energy prices (1970-2012) of natural gas, diesel, LPG, gasoline, and electricity for Nebraska, Wyoming, Montana, and the United States. In general, energy prices have increased over time for all states and the United States; however, the rate of growth has varied among energy sources. The most prominent example of this is how electricity was on average the most expensive energy source between 1980 and 2000 and then became one of the cheapest, second to natural gas, between 2000 and 2012 among the states. In addition, energy prices have varied between states. In 2012, electricity was $20.54, $17.64, and $14.96 per million BTU in Nebraska, Wyoming, and Montana, respectively; whereas, natural gas was $4.26, $4.71, and $7.36 per million BTU, respectively. Geographical location can also influence energy prices due to the availability of different energy sources in the state. One observation worth noting is diesel, LPG, and gasoline have had a rapid increase in energy price since 2000 and electricity has had a positive increase but less than the aforementioned; natural gas had a similar increase in electricity up to 2006 and has then shown a decreasing trend for all states. Natural gas may prove to become a primary source of energy for irrigation depending on future projections. However, the overall selection of a power source will depend not only on price, but also efficiency. Duke, H.R. 2007. Pumping systems. In: Design and operation of farm irrigation systems 2nd Edition. American Society of Agricultural and Biological Engineers. Evans, R., R.E. Sneed, and J.H. Hunt. 1996. Pumping plant performance evaluation. North Carolina Cooperative Extension Service AG452-6. Plains Irrigation Conference, Burlington, CO., Feb. 22-23, 2011.